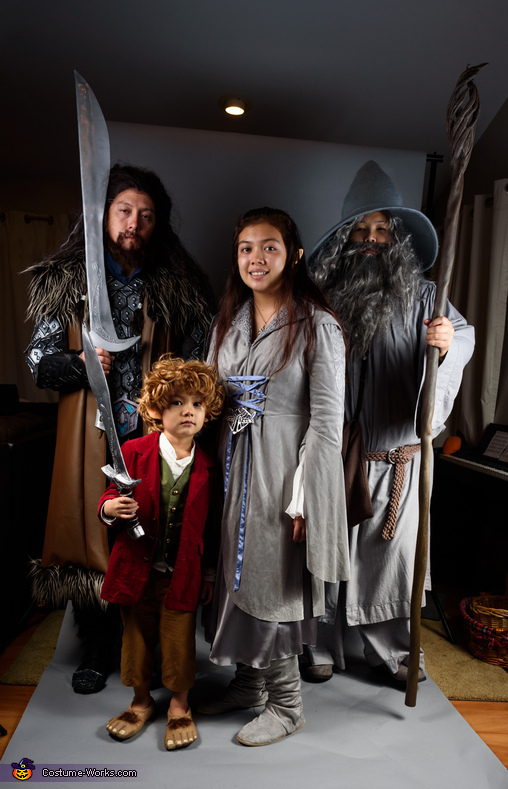 Our family has always been big fans of the Lord of the Rings and Hobbit books and movies. This year we decided to go for it and build almost entirely from scratch each costume. Each family member could pick their favorite character and I started building the costumes in mid-September. This is the result of 6 weeks of no sleep. Sorry for the length of the information but there was a lot that went into the build and a lot of details so I’ll cover all of them and you can read what you like. I started with Bilbo Baggins portrayed by my son Max (4). I purchased the material from a local fabric store. I tried to stay true to the movie's character by choosing appropriately colored fabrics and textures but making sure to stick to thin breathable fabrics because it's usually still very hot here in Hawaii this time of year. I was able to find basic patterns for the shirt and jacket on Etsy which I downloaded but ended up having to tweak a lot to more closely represent the style. I drafted the trouser pattern by hand and the vest I drafted by referencing a vest that we already owned. Since my son is very young I knew an itchy wig would make him cry and complain and I couldn't find a wig for a child that was really the right style so I decided to hand make the wig. I went to a Sally's Beauty Supply and found some real human hair that was marked down and was about the right color. I also purchased there a weaving cap which was like a fishnet stocking for your head. I hand sewed the hair to the cap then cut it short and used curlers to curl the hair. I found the ears at a local store which was actually part of a really cheap Link (Legend of Zelda) costume. I ditched the rest of the costume and took the ears and sewed them onto the wig so it would be easy to keep on him. The feet were a little challenging. I purchased cheap canvas shoes from Walmart and traced out my own foot shape on upholstery foam. I cut the shape out of the foam with a razor. I then hot glued the foam feet around the shoe and covered the foam with rubber cement. After that dried I used Kwik Seal to cover the whole shoe (I used several coats for make sure it was strong) I then used press on toe nails to add realistic toe detail. I painted the whole shoe with acrylic paints and then added some hair to the top with more rubber cement. The ring I purchased from Amazon.com, they have quite the selection of rings of power. Next I worked on the Arwen costume portrayed by my daughter Nyssa (13). I used a reference photo I found online of the riding coat she wore in the chase scene. The original dress was made from a grey suede fabric. I was able to find a similar faux suede fabric from Fabric.com. I also ordered from the same site the crepe fabric for the under sleeve. The inside of the coat was lined with a sort of spiderweb like grey lace which I couldn’t find so I found a white lace that was similar and dyed it with Rit dye. I found a similar colored grey satin for the undercoat and a periwinkle (This was so hard to find) satin for the ribbon at a local fabric store. I couldn’t find any patterns that closely resembled the coat so I decided to draft the entire dress by hand. I used the Surefit Designs system (see YouTube surefitdesigns). I believe the hardest part of all the costumes I made were the patterns. Normally I would just start hacking away at the fabric since it’s a costume but due to the fine quality of most of the fabrics I decided to make every very well. The sleeves of the coat were challenging it seems that the original coat had the design etched into the suede and then painted around with the design. I found a copy of the pattern online and I printed it lightly onto an iron on transfer paper. I then carefully cut out the design with an exacto knife. I then ironed on the cutout design onto the sleeves. The result was a sort of faux etching on the fabric. I then used a fabric paint pen in silver to outline the design. The buckle was made from instamorph moldable plastic sheets which I cut out piece by piece then joined them by using a hot knife to melt the ends and a few pieces of instamorph pellets to fill in gaps. I spray painted the buckle with metallic rustoleum spray paint. I also made her shoes with the same material I used to make the coat. I hand drew the pattern and affixed the material to a cheap pair of flats. The ears I bought on Amazon.com. After that I started on Gandalf portrayed by me. I started with the hat which I made from grey felt, foam and heavy interfacing I bought from my local fabric store. The brim is stabilized by the interfacing and the top is stabilized by a thin fabric covered foam. The robe and pants are made from raw silk I purchased from ThaiSilks.com. The color wasn’t dark enough so I dyed it with Rit dye. I was careful because silk takes dye really well as I found in the test piece. The robe may have been the hardest thing to cut out. There are pleats in the front, back and sleeves (Again trying to stay true to the movie). I ended up pleating the fabric first and then cutting it out. I also had to dye the cotton string used to lace up the front of the robe and the drawstring pants. The pants I drafted using the Surefit designs method. I used cotton rope for the straps of the bag and the belt which I dyed with Rit dye. I found the fabric for the satchel at my local fabric store and I just eyeballed the cutting and after I was done I rubbed it with sandpaper to make it look worn and old. I also found a loosely woven material for the cloak but I had to dye it darker to more closely match. I just eyeballed the cutting and sewing of the cloak since it was raggedy looking anyway. I bought the shoes and I bought the scarf from Hobbitshop.com since I knew accurately replicating the scarf would have been too hard. The pipe was made from a clear acetate straw which I used a heat gun to bend slightly. I then used instamorph moldable plastic pellets to make the bowl. Note the instructions say to boil the pellets but I found that a heat gun works much better. I shaped it by hand then while it was still soft I stuck the straw threw. I sealed any gaps with more pellets and a hot knife. I used the hot knife to groove the pipe for a wooden effect then painted the pipe with acrylic paint. The staff is something I’m quite proud of. First off I used a thin PVC pipe (the kind used for sprinkler systems). I used my heat gun to heat and bend the pipe into shape using a reference photo. There is a crystal inside the staff that lights up. I used pieces of broken glass bought from a local craft store, the kind used for floral displays. I found pieces that fit together and I hot glued them together. I then used clear packaging tape to tape the stone to the top of the staff. There is a LED firefly light string that attaches to it and then goes down the shaft so that the switch is at the bottom an I can turn it on and off. The top of the staff was made using foam floor mats. I cut out the shape then using a hot knife I carved out the details. I used a heat gun to bend the foam into shape then hot glued it to the top. I then used a hot knife to groove the staff shaft to look like wood. I filled in any gaps between the head and the shaft with Kwik Seal and then painted it dark gray brown and then using a dry brush technique painted with 3 different shades of lighter gray browns to replicate the driftwood look. I purchased the boots from a Ross store. Lastly, I made the Thorin Oakenshield costume for my husband Johnny. I was really pinched for time since I only had 1 week left but I pulled it off with little sleep. I purchased the wig from purple-plum.com but it was a bit long and fluffy so I trimmed it and then tied it half back and braided two strands by the ears. I had some aluminum flat wire that I crimped around the ends. The beard is made of mehron crepe hair that I bought on Amazon.com and I applied it with spirit gum. I purchased blue fabric for the shirt, a dark grey suede for the armor, blue velvet for the vest and brown faux leather for the coat at a local fabric store. I used the Surefit designs method to draft the shirt which is much like a mens dress shirt but I used a mandarin collar and instead of button holes I used laces made from the same fabric to lace up the front. I made the armor by drafting the base by hand. It also laces but up the back. For the metal pieces I used craft foam. I cut the shapes out and then used pyramid shaped studs bought on Amazon.com for the detail. I then bordered each piece with hot glue to give it the raised edges. I painted each piece with acrylic black paint first then went over them with a dark silver with a dry brush. I found that using long strips of folded over tape to affix the pieces to a roll of paper made it easier to paint them. I also left them on the paper to dry. I hot glued the pieces to the suede. The vest was drafted by hand then cut and sewed. I also drafted the coat by hand and then sewed it with the faux fur trim. The belt was a strip of black faux leather I had and I sewed magnetic snaps to the ends. The buckle was actually just a inkjet print of a photo I found online which I glued onto a piece of cardboard and then brushed with satin gloss lacquer. I wish I had more time for that but I was just running out of time to make it the way I really wanted. The gauntlets I made with craft foam I found the template online and I cut them out with an exacto knife then laid them on another piece of foam so it looks like it was etched out. I glued each gauntlet onto two strips of black faux leather which I had sewn on buckles. I had to use E6000 glue to attach the foam to the leather since hot glue would not stick to it. The boots are made from cheap gardening boots I purchased at Ross. I painted them black with a matte acrylic paint then I used hot glue to affix the faux black fur. I also cut strips of faux black leather for the straps and added buckles. The leather was glued to the heal of the shoes then I wrapped them around and buckled them at the top. The toe caps I drafted by looking at sketches and pictures on line. I used craft foam for the details which I cut out with an exacto knife. I used chip board for the base and I assembled it all with hot glue. I then painted them in the same manner as the armor. Since the toe bent as my husband walked I couldn’t get the hot glue to stay and so I had to again use E6000 to glue the toe pieces on. The shield was made of foam floor mats. I glued two of them together with contact cement and then cut the shape out with a hot knife. I used a heat gun to shape it and then used craft foam to add a little bit of branch detail. I then used the hot knife and scored the shield to look like bark. I painted the shield with acrylic paints dark brown first then lighter browns with a dry brush to look like wood. I used black faux leather for the straps with sewn on buckles. I then glued the shield onto the straps with E6000. For the sword I used a cheap yardstick to add strength to the blade which I sandwiched in craft foam the cut the shape out with a blade. I used a soft carving wood I found at a craft store and carved it into the shape of a dragon’s tooth which is what the sword hilt was said to be made of. I carved out the middle to fit the blade in and hot glued it in place. I then scored the wood to look like the original. I used foam floor mats for the cross guard and then craft foam for the pommel. I found the template for the inscription from Stormthecastle.com and I printed the pattern out onto clear sticker backed acetate sheet I bout on Amazon.com. I used my hot knife with a pointy attachment to carefully burn out the details, then I removed the stickers so I was left just with the detail etched into the foam. I painted the hilt brown with acrylic paints then used silver spray paint for the blade and details. We already had the key because I bought it from Hobbitshop.com for my daughter a few years back and I just tied it onto a leather string and the costume was finished. Now that I had a little time left I decided to make the sword Sting for my son. I made it in a similar way to Orcrist but I used the foam floor mats for the hilt instead of the wood. I had some vinyl faux wood contact paper which I wrapped around the hilt. A heat gun made it conform nicely. I cut out the leaf pattern on aluminum tape (the kind for duct work) I found at a hardware store and then wrapped it around the hilt. I covered it in a satin finish lacquer to keep it on nicely. I did the etching in the same way as the other sword. I also found the template at Stormthecastle.com. I spray painted the blade, cross guard and pommel silver and I was finished. At last my project was complete. Overall cost… Oh, I hate to think about it. I’m sure it’s close to if not more than a thousand dollars. I hope you enjoy them as much as I enjoyed making them.